Tales of a summer with a 91 (now 95!) year old: Who's going to eat the wings? Who's going to eat the wings? 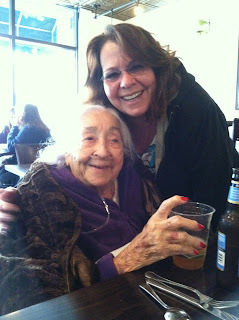 Although I thought I was done with this blog, Mom's been in my mind so much recently that I knew I had to get this down. I got up this morning and made Sharyn a lunch for the road as she's headed to NC for a bit. Mom always sent travelers off with a lunch sack - always. Sometimes it was a salami sandwich on rye with mustard, an apple, and some nuts. Sometimes it was a roast beef sandwich with horseradish dressing (my favorite). No matter what, travelers must have food in the car. In fact, when I used to take my folks up to Laughlin in Nevada for their gambling fix, we used to kid Mom as she'd be into her lunch sandwich before I even got to the first light. She was not one to let anyone go hungry. So, as I opened the rotisserie chicken to slice off some meat for Sharyn's sandwich, I glanced down and saw the two wings - mom's favorite part of the chicken. I melted. My first thought was "who's going to eat the wings?" Mom would always be the one who would call the wings when she saw me walk in with a rotisserie chicken. She'd call them early sometimes too as in "If you go to Costco tomorrow and get a rotisserie chicken, I'd like the wings for lunch." This behavior always reminded me so strongly of the times that my sister would call the front seat for car trips. In fact, an hour or two before the trip, we'd find Steph in the front seat, by the window, reading a book, waiting patiently for the rest of the family to appear. Must be an inherited trait. Anyway, two wings along with a bit of potato salad and a roll would make up Mom's favorite meal. So, as I looked at the chicken, I just sort of dissolved. For the first time ever, I didn't know who would eat the wings, and it was quite a quandary for me. I've never given anyone else the wings. Ever. They were always Mom's. I'm surprised by the things that set off my grief. I'll be fine one moment and just a puddle of tears the next. I know that it's normal, the grieving process and all that but it still is hard to get through. So, on Sunday, I shall don her butterfly clip in my hair and wear it proudly all day. I'll put on a pair of her signature goofy socks and walk around the house - heck, I might even go out in them. I'll go visit her grave and drop off some flowers. And I'll try to keep it together. I'll try. So sweet. Happy Mother's Day, Lori. Even though Gert won't be there with you, she'll always be with you. You are so brave. I really admire you and your strength. She was blessed to have a long life.